Planned for the Anzac Centenary in 2015 was a major exhibition on the 'war to end all wars'. Unfortunately the support from the Federal Government fell well short of that promised. The funds arriving too late to complete the works by ANZAC Day, personal funds kept work on some of the dioramas slowly progressing. Appeals directly to Canberra and also to Federal Lucy Wicks, fell on deaf ears. Furthermore, during the delay the value of $AU plummeted, effectively about 25% of the value of the grant was lost, calls for assistance to make up the loss have gained nothing. ​At this stage only those works covered by the Gosford City Grant have been exhibited. With the others, twelve months after due completion, still only progressing very slowly with personal funds. A window of opportunity was there to complete some unique works for the people of the Central Coast and in at least one case, this has now been lost. The display panels are designed to compliment 4HRs existing 'Submarines Off The Coast' exhibition. A number of dioramas were planned, including: 'Albany Convoy', 'The Western Front', 'Western Front Field Hospital', 'The HMAS Parramatta and Swan' project and 'The Battle Of The Cocos Islands - HMAS Sydney/SMS Emden'. One major diorama and two smaller supporting smaller dioramas were planned for the Light Horse in 'Palestine' exhibition. Considerable planning went into the work for the dioramas but sadly the display for the Centenary of ANZAC fell well short of expectations. Work is still progressing slowly, relying on personal funds, some works like a scene of wounded Light Horse at a field hospital will probably now never be completed. Above: we present the development of the diorama 'Advance Across No-Mans-Land, Western Front', it depicts no particular battle, however, seeing that they were all much the same for most of the war, we have built a typical scene. The soldiers in the foreground of the diorama wear green and blue patches of two Sydney regiments. The accompanying graphics will present the names of all the Central Coast soldiers who died in this war. Simple statistics will show what Australia lost…which was a great deal, and what it gained…very little! 4HR had a number of dioramas and exhibitions planned for the Anzac Centenary. With the Anzac Day deadline looming, the promised Federal Government Anzac Centenary Community Grant was firstly reduced at the eleventh hour and was actually not forthcoming until April 24, the day before the exhibition day. The Gosford Council Community Development Grant, which arrived in due time was quickly used up, in an unplanned way and personal funds had to be expended to maintain some momentum on the projects. A number of the original volunteers, all a bit disillusioned by the lack of Federal support, dropped out. 4HR had approached Gosford Men's Shed for assistance with the 'West Head Battery - Inclined Railway' Project, hearing about the WWI project the Men's Shed quickly jumped in to help with the 'WWI-Advance Across No-Mans Land' diorama. Great work guys! Model making commenced June 2014. Below: A lot figurines are in hand, others are in various stages of completion and painting. Considerable time has been spent on this Mark V tank, with blast holes revealing the reduction gears and chain drive inside the hull. Also the right hand sponson has been 'blasted' open to reveal the highly detailed breach of one of the tanks main guns. The damaged rear door has been prised open to allow the surviving crew members to escape, before the stationary vehicle is further targeted by German artillery. The two surviving (but wounded) crew members are yet to be installed amongst the dead and wounded infantry. Meanwhile the modelling continued on other tanks, with 4HR's youngest volunteer Ollie, our official 'putter-ona-of the glue cap', helping out on #5 of the planned eight tanks. When our original 'sparkie', come lighting technician went off line, Daniel provided a transformer and did the lighting with his expert understanding in the 'black art' of electricity. Not only did Doug and Lee do a fantastic job building the complex diorama base and display box, but Doug also had to act as delivery-man when 'The Shed' needed the space and 4HR couldn't arrange transport for the work, for at least a few days. As can be seen in the photograph at the Mens Shed (above), if the wood work looks complex, that's because it was...the guys spending a total of 75 hours putting it all together. 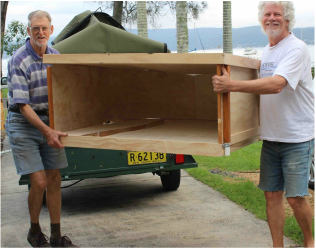 Put simply this diorama just would not be happening for Anzac Day without 'Gosford Men's Shed'. Below: We couldn't wait to set the figures onto the diorama baseboard. To trial the layout we had laid the finished (and part finished) figures and models out and photographed them ... rearranged them and photographed…rearranged them and photographed and so on and so on. The dented, scratched and worn water bottles on the soldiers belts look like you could remove the caps and have a drink. 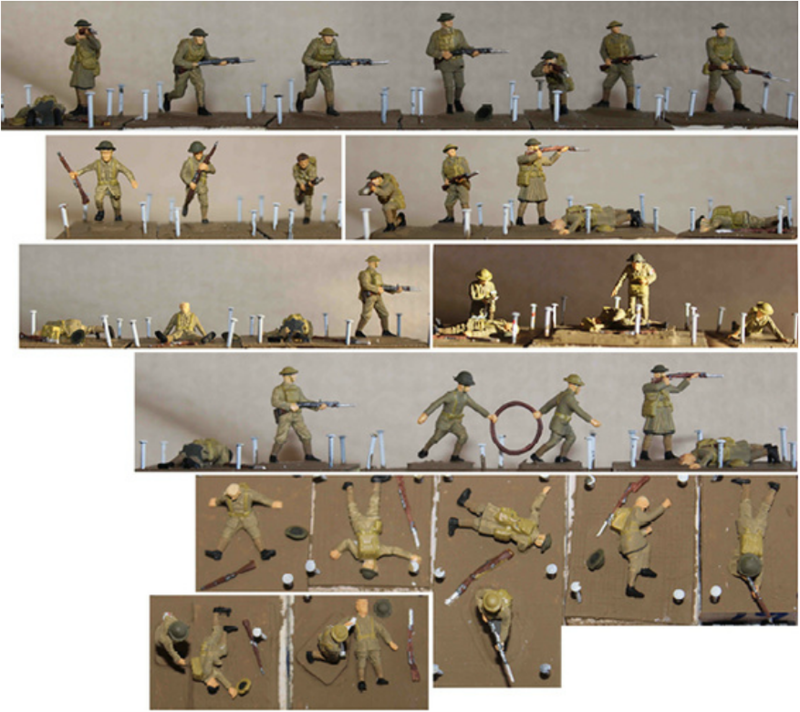 The 'Advance Across No-Mans-Land' diorama required some 1:72 scale figurines for the background, so 40 figurines were started. A dozen of these small figures were modified to become casualties before painting was started. While set in the background these figurines will never-the-less be a very important part of the overall work. 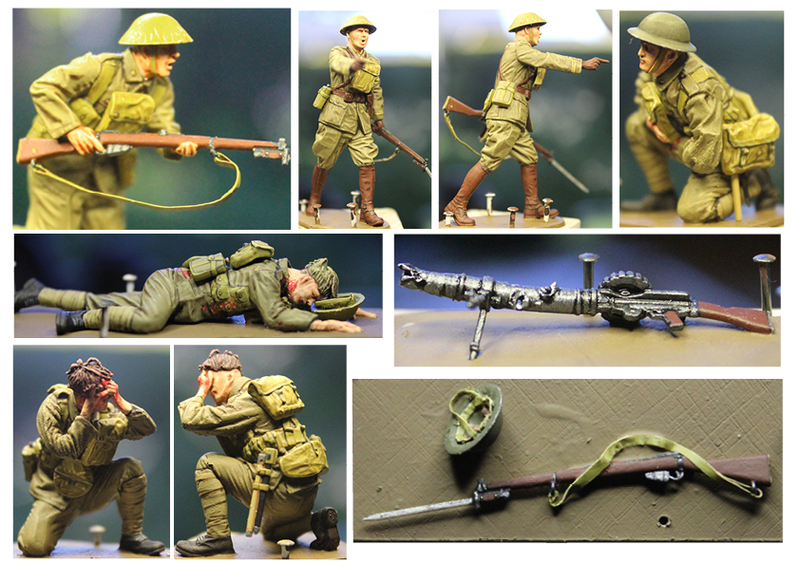 After completed about 40 of the 1:72 scale figures, modifying, detailing and painting to some 1:35 scale wounded soldiers for the foreground. The parts were from 'Tamiya' and all were significantly modified. 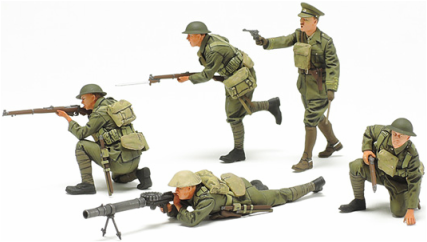 Below: 1:72 scale background figures. Despite the fact that they are only very small and many are from very rudimentary moulds, which provides little detail to assisting in painting, they have come up very well indeed. Modifications to many of the small figures was a lot of major and difficult to do. This is particularly the case with the ones representing the dead, wounded and those having wounds attended to by medics. Given that these small figures are to the back of the diorama, the detailed work may not fully appreciated by some, however, these figures will add a tremendous amount to the overall perspective and atmosphere of work. Below and Right: A Tamiya product of five figures was chosen for some serious kit-bashing, the original sculptures can be seen right. 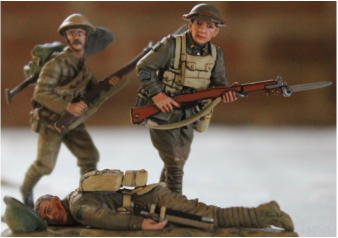 We needed to raise the quality of the wounded on the diorama so three of the figurines were modified accordingly. The figures were converted to wounded and/or dead, the officer remained unscathed but had his revolver removed and he was provided with a .303 rifle, the fifth member of the group was mainly constructed as per the kit, all-be-it with additional detail like a scratch made rifle strap (below top left). Following discussion it was decided the wondered lewis gunner's weapon, if intact, would not have been left by the advancing troops so it was carefully 'damaged' to be placed on the battlefield alongside its stricken operator. These 1:35 scale figures are much larger than the 1:72 figures. All up it's taken 34 hours to complete the 1:72 figurines and 96 hours for the 1:35 figurines. Everyone who has taken a close look at the works are amazed at the detail, in particularly most have found the wounded figure's face, below top right, tells a poignant story. 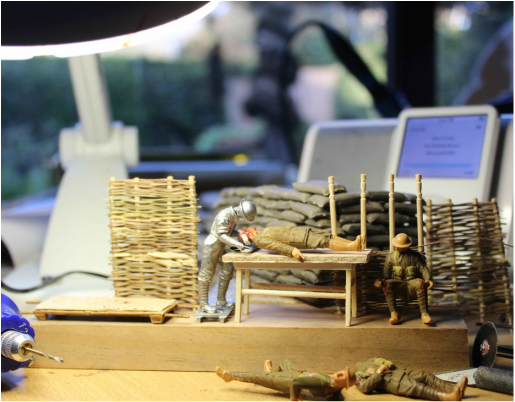 Because of the disruption to the exhibition's planned production for the 2015 Anzac Centenary, due to the significant delay in the promised Federal Government funding there was only one diorama ready for display as a 'work-in-progress' by Anzac Day. Thanks to Gosford City Council Community Development Grant plus significant input from private funds, three completed model ships, Emden, Swan and Sydney were ready. These were exhibited in display boxes built by Bateau Bay Men's Shed, who 12 months later, have still not yet been reimbursed for the materials. The Swan's graphics, including a detailed cut-away have been completed, taking around 1,000 volunteer hours. The graphics for HMAS Sydney are partly complete, with an external view of the ship finished, the cut-away view is about 25% completed, around 850 hours has gone into this work so far. The failure of the Federal Government to provide the promised funds in time to pay for high quality print-outs, by the 2015 Anzac Day Centenary, saw the exhibition fell well short of that deserved by both those servicemen being commemorated and also by the volunteers who had put so much effort into producing the exhibition works. Another six dioramas are at various stages of completion, were in no way ready for even a work-in-progress display for Anzac Day. These will now be finished at different stages as funds become available…all a great disappointment. Six dioramas that did not appear on the Centenary of Anzac Day, these were; 'Western Front-Across No-Mans-Land', 'Western Front- Field Hospital', 'The Australian Light Horse at Beersheba/Lawrence of Arabia', 'Albany Convoy' and 'Gallipoli-The Landing/The Neck'. 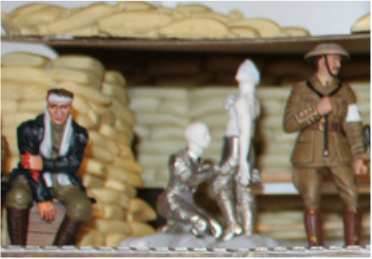 Above: The 'Western Front-Field Hospital' diorama, few more figures will be added to these fifty odd figures, some requiring finishing and painting to complete this diorama. The base and back screen are still required detailing, other detailing items have been painstakingly hand made and assembled including wicker, wire, sandbag revetment walling, corrugated iron, duck boards, stretchers and barb wire. An interesting list of wondered and dead includes captured German soldiers. Obviously todays Allied attack was successful taking many wounded prisoners, tomorrow the counter-attack will probably see the trenchers outside German feild-hospitals full of Allied soldiers. Mini scenes abound; a wondered pilot, a dead soldier with mates standing alongside while a padre sprouts a few words, a comforting cuppa for an injured soldier and more bringing in the dead/wondered. Above: The two figures involved in the standing soldier having dressings changed are a combination of white metal parts (the sliver parts) from France and from Germany Preiser plastic figure parts (the white parts). When finished the diorama will present a very evocative scene, it will be the next diorama completed after 'Advance Across No-Mans-Land'. Left: Work on 'Western Front-Field Hospital' continues, here in a busy studio looking out at Yattalunga Bay. A blood stained stretcher, individually made woven wicker trench revetment walling. The white metal (pewter) hospital orderly is assembled being modified from an engineer kit, he stands on a duck-board, both are from 'Grande Guerre' and are yet to be painted. The other wounded figures are modified from 'Master Box' kits. In the background, the sandbag wall is made from individually laid bags in various sizes to produce a 'forced perspective' effect. Above: These eleven Light Horsemen along with a few more mounted mates, to be added, will be depicted as at the charge at Beersheba. The mounted soldiers will be joined by dismounted Light Horse and Turkish infantry, fighting in Beersheba's second line of trenches. Most of figures are in hand, they will all make up 'Charge at Beersheba', the second of 4HR's two large WWI dioramas, three smaller works are currently being worked on. In all over thirty-five mounted and dismounted figurines are in hand. Other figures are in production, with some major modifications currently being undertaken to some U.S. Calvary figures and horses. Left: Turks ready to defend at the trenches. Below: Some of the figures ready for the fierce hand to hand fighting in the second line of the Beersheba trenches. Left: Encouraged by the retreat of Anzac, British and French troops from Gallipoli, the Turks moved on Suez. While Indian troops bore the brunt of the attack, the lighthouse played an important role. A mini diorama is being built of a night recon. of officers by a damaged Lewis Gun position. Left: Supporting the British advance through Palestine, the capture of Jerusalem and Damascus were King Faisal's Arab troops under T. E. Lawrence. These two Palestinians will be joined by a few others and their commander, Lawrence of Arabia in another mini diorama depicting an important part of the campaign to wrest the middle-east from the control of Turkey. 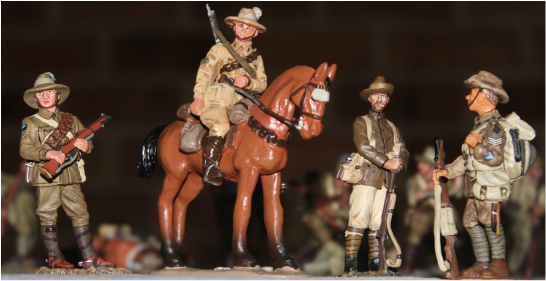 Left: A few additional supporting troops, a dismounted Light horseman, a mounted mate, a Light horseman on guard with a pet pooch and an Anzac Infantryman. 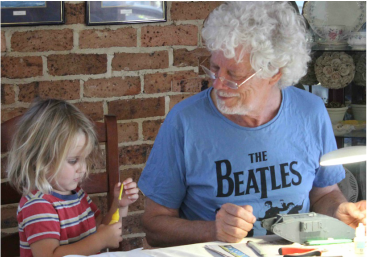 The work continues slowly, kept going by private funds, hopes were raised when a letter from the Federal Member announced a new round of grants. Sadly the application form arrived the criteria excluded any from of exhibition material. So despite the expenditure of significant funds and a few thousand volunteer hours over the last 20 months, these works lay un-completed and not on view to the Mums, Dads and kids of the NSW Central Coast.